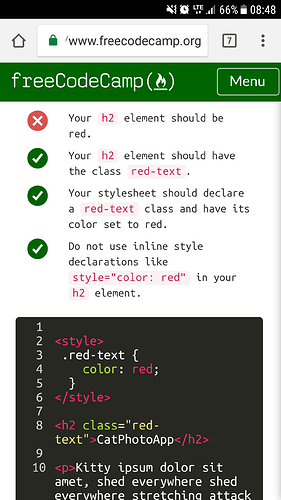 Use a CSS Class to Style an Element. Help! I looked into the code a thousand times now and I can’t seem to find the mistake… Can anyone else see something? Your Browser User Agent is: Mozilla/5.0 (Linux; Android 7.0; SM-G930F Build/NRD90M) AppleWebKit/537.36 (KHTML, like Gecko) Chrome/63.0.3239.111 Mobile Safari/537.36. What is the error you are showing? When I run your code, I pass the tests. You may need to refresh your page and then try running the tests again. If that does not work, then click the Reset your code and enter the correct code again and then run the tests. 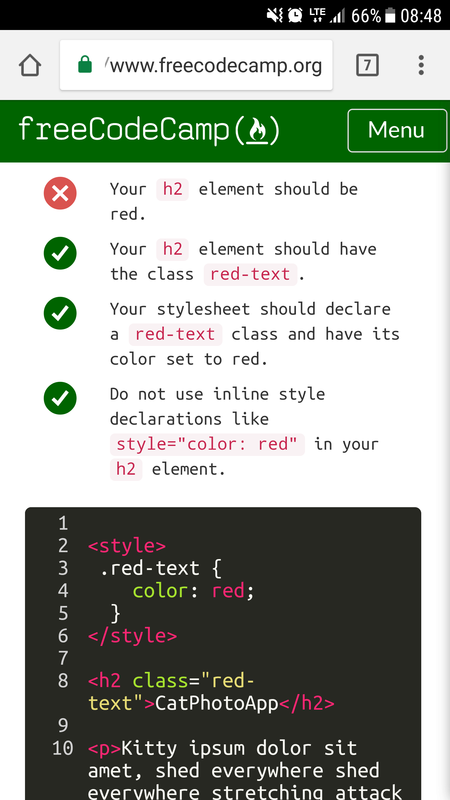 Sometimes, the tests on these earlier html/css challenges are kind of buggy. OK, I switched to Chrome on Desktop and re-edited the code and it worked. Challenge done.